Direct Beachfront Condo - SPRING SALE 20% OFF!Amenities Galore! Celadon Beach Resort condo rental 1003 in Panama City Beach, FL is the perfect destination for your beach vacation. Celadon Beach Resort vacation condo rental 1003 is a 1 Bedroom plus bunk area, 2 Bathroom direct beachfront condo sleeping 6 people featuring all the comforts of home. 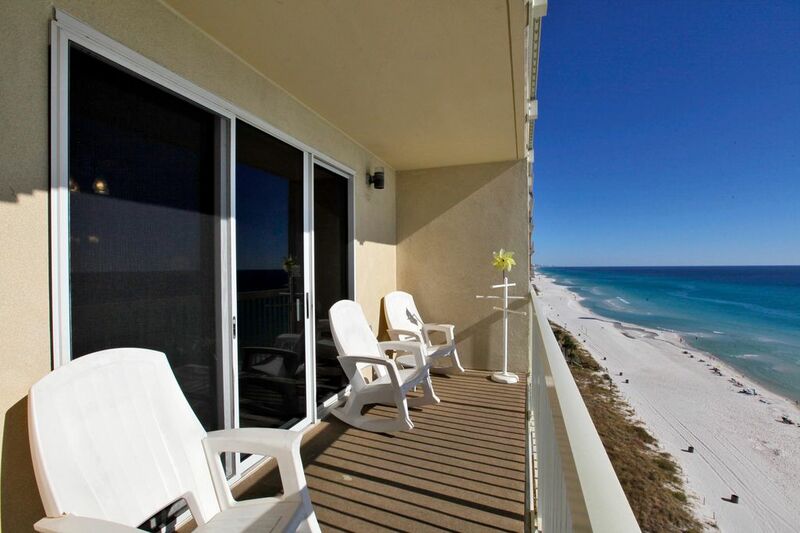 Celadon Beach Resort condo rental 1003 boasts fantastic views of the Gulf of Mexico. Welcome to your home away from home at Celadon Beach Resort. Enjoy your beach vacation in Panama City Beach! Celadon is definitely a family favorite vacationing in Panama City Beach, Florida! Celadon Beach Resort in Panama City Beach, Florida is a family friendly resort offering all the amenities one would expect to compliment a family beach vacation. It's hard to imagine a more perfect vacation when you stay at Celadon Beach Resort situated directly on the Gulf of Mexico in Panama City Beach. You'll enjoy breathtaking views from the balcony of your condo rental. Celadon Beach Resort boasts lush & tropical gulf view pools (heated seasonally), indoor pool w/spa, tennis courts, fitness center, barbecue area and covered parking. Celadon Beach Resort is located on the west end of Panama City Beach, near the entertainment and shopping district. Celadon Beach Resort is a true beach escape. Panhandle Getaways offers over 450 vacation rentals along the Panhandle of Florida. Our vacation rentals in Panama City Beach, along 30A, Destin, and Ft. Walton Beach, Florida provide the perfect vacation spot for your next vacation. Panhandle Getaways features a variety of property types which allows us to offer something for everyone. Panhandle Getaways specialty is helping guests find the perfect vacation rental for them and being that we have been in business more than 25 years, one can be rest assured that Panhandle Getaways is a name you can trust. Celadon Beach Resort Family Friendly Paradise! Best bank for your buck with all of the amenities one seeks when looking for a beachfront vacation rental in Panama City Beach. Panhandle Getaways specialty is helping guests find the perfect vacation rental for them. We have been in business more than 25 years and Panhandle Getaways is a name you can trust. Celadon Beach Resorts' central Panama City Beach location makes the property a highly sought after destination along with its fantastic family friendly amenities offering something for everyone. Enjoy breathtaking direct beach & gulf views daily from your private balcony! Celadon Beach Resort is a direct beach and gulf front resort boasting incredible views from each balcony! Close to Pier Park! Fantastic Family Friendly Resort located very close to Pier Park! Celadon Beach Resort is a direct beach and gulf front resort boasting incredible views from each balcony! Close to Pier Park! Dining Area & Breakfast Bar provide ample seating for all in your party. Thank you so much for the kind words! We hope you make this your favorite vacation spot. We would love to see you again soon. Great condo. We loved it and it was very clean. Will stay again. The property was convenient to everything. The view was spectacular. We loved it. The unit was well stocked and exceeded our expectations. Everything was beautiful and very clean. I loved the decor. Elevator service was also great which is unusual in a high rise. Thank you! CELADON BEACH RESORT IS VERY CLOSE TO PIER PARK! FAMILY FRIENDLY, DIRECT GULF AND BEACHFRONT. CLOSE TO ALL OF THE FUN THINGS TO DO IN PANAMA CITY BEACH, FLORIDA!